Suitable only for persons of 15 years and over. Not to be supplied to any person below that age. This is an Eros Internation brand of the Hindi DVD. Has no UPC Code. Has Eros Seal AC 367413. 133 minutes Color. Dolby Digital AC3 Sound. HAS ENGLISH SUBTITLES. Produced By: Arjun Ningorani. Directed By: Mukul Anand. Music Kalyanji Anandji. Staring: Dharmendra, Sunny Deol, Sridevi, Karan Kapoor, Juhi Chawla, Amrish P:uri, Shakti Kapoor & Others. Release Date: 11 Mar 1986 (India). Sultan is the only son of Mr. and Mrs.Razoulli and lives a comfortable life. Sultan has been taught all the skills needed for a warrior to defend himself and his tribe circa the Mughal rule in Asia. 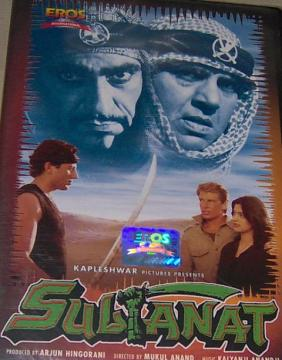 Sultan falls for Shehzadi Yasmeen, is captured by her troops, tortured, made to enter a death-race which he not only escapes from but also abducts Yasmeen. Eventually Yasmeen and Sultan do fall in love with each other. Than Razoulli is killed and his wife loses her senses, Sultan swears to avenge his father's death, and comes to know that the person responsible is General Khalid. Sultan comes to know that Khalid's son, Samir, and his fiancée, Zarina, are to arrive, and he decides to abduct them, though in vain. Khalid comes to know about this and decides to kill Sultan. What Khalid does not know is Sultan is none other than his son, who was abducted at a young age, and left with Razoulli. But now it looks like the duel between father and son will only end when one is killed by the other. 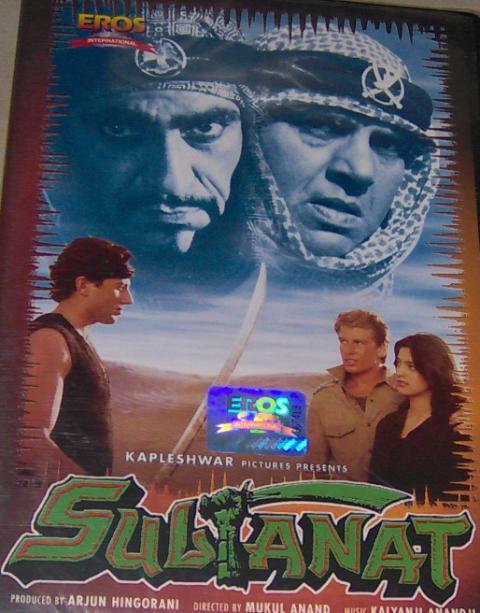 Buy Sultanat (DVD, 2000), sold & shipped by Movie Time Video where you can shop online for Pooja Mandir, Bajot, Gifts, Hindi Movie DVD / CD, Music Video. This Hindi Movies collection has been tagged as DS7-5 5 NEH 7.00 14.93 dharmendra dunny deol sridevi karan kapoor (S 1).